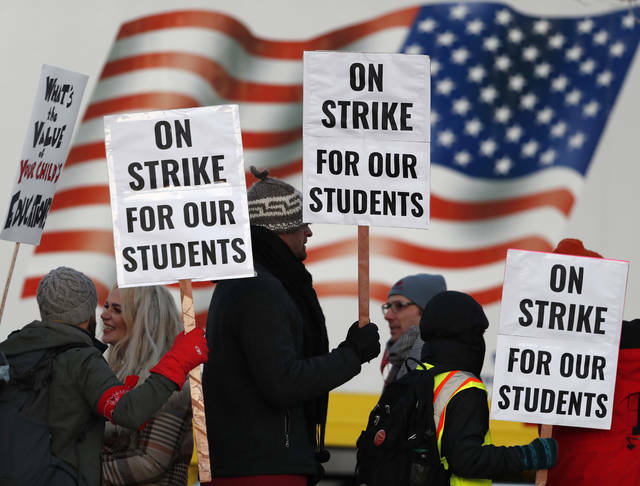 DENVER (AP) — The teacher strike in Denver entered a second day Tuesday with educators disputing pay back on the picket lines and union and school officials set to resume negotiations in an effort to end the walkout. The strike affecting about 71,000 students in the school district began Monday after last-minute negotiations broke down over the weekend. All schools were open and staffed by administrators, substitutes and teachers not participating in the strike. The negotiations were scheduled to start late Monday morning. According to preliminary reports from the school district, 58 percent of teachers stayed away from district-run schools, slightly more than on the first day of the strike Monday. The walkout came about a year after West Virginia teachers launched the national “Red4Ed” movement with a nine-day strike in which they won 5 percent pay raises. Most recently, Los Angeles teachers went on strike last month. 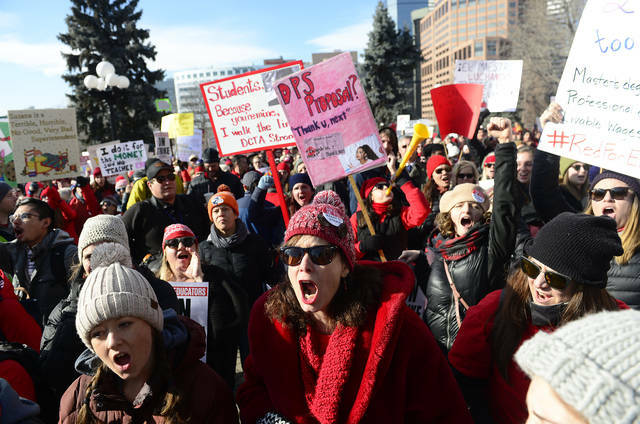 Lily Eskelsen Garcia, president of the National Education Association, told a crowd of picketing teachers outside the Colorado State Capitol on Monday that theirs was the latest in a national movement to provide just compensation to educators. Kimberly Beckeman, a ceramics and sculpture teacher at South High School, said she cried when the union announced teachers would go ahead and strike after 15 months of negotiations failed to produce a deal. She said she did not want to leave her students, but it was time for teachers to act. “It’s what’s right. It’s not ideal. I don’t want to be out here,” she said on the picket line outside the school Monday. The district sees the disputed bonuses as key to boosting the academic performance of poor and minority students. 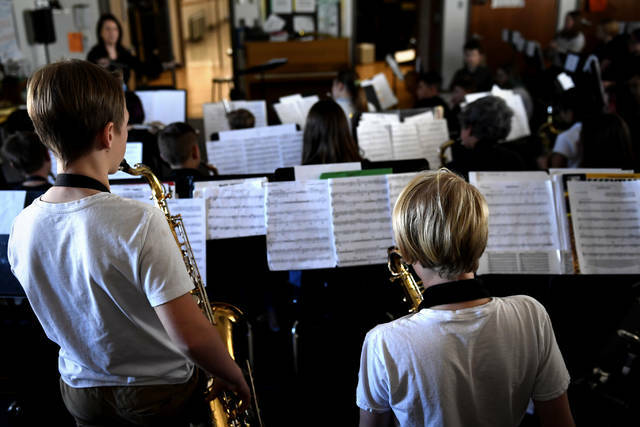 Denver teachers say the reliance on bonuses in the district leads to high turnover, which they say hurts students, and that spending money on smaller class sizes and adding support staff, like counselors, is the best way to help disadvantaged students learn. The coverage of the Covington Catholic (Kentucky) High School incident during this year’s March for Life may have shown journalism at its worse. Depending on your bias, you could find a version of the event to confirm it. In this age of 24/7 news and instantaneous coverage of events, journalists and the media that employ them have incentives to be first with a piece of news. If they get it wrong, many don’t engage in introspection; they simply move on. Partly this is a result of two conflicting definitions of what constitutes journalism — writing characterized by a direct presentation of facts or description of events without an attempt at interpretation and writing designed to appeal to current popular taste or public interest. The second definition, which seems to be the one followed today, has no emphasis on facts without attempted interpretation. Interpretation moves an article from reporting to opinion without acknowledging it. The lessons that not only journalists should take from the Covington Catholic incident and similar ones is one that I learned from a former colleague, Phil Goulding, who wrote a book “Confirm or Deny” after his tenure as assistant secretary of defense for public affairs. That lesson is “first reports are always wrong — or so often wrong that they always must be considered suspect.” He amended that later to say third reports should be taken with a grain of salt. At least that is my recollection. The volume of what is described as news is so great and comes at us so rapidly that all of us would be better served by starting with the view that I am not convinced and then look for information to confirm or deny. This can be accomplished by not being a slave to a single or small set of sources and by recognizing the dangers of confirmation bias — tendency to not view information objectively. The bottom line for readers and listeners is to avoid jumping to conclusions. For journalists, it is to focus on getting it right rather than fast. Fifty years ago, the Supreme Court upheld the right of a 13-year-old and her friends to protest peacefully against American involvement in Vietnam at their school. The justices’ decision in the landmark free expression case Tinker v. Des Moines provided us with indelible imagery and a lasting statement about student free speech and symbolic expression. Fifty years after that moment, it is difficult to celebrate this benchmark ruling without a little disappointment. Tinker just isn’t what it used to be. —Corporations and advertisers have found increasing amounts of protection. —Safeguards for hateful, offensive speech, such as the ideas communicated by the Westboro Baptist Church, have been reinforced. —Justices have struck down laws that limited flag burning, lying about military honors, and selling videos that depict animal cruelty. Free speech in the public schools might just be the only area where First Amendment safeguards have narrowed, rather than expanded, in the past half century. It seems the court has hung Tinker out to dry. In Bethel v. Fraser in 1986, the court concluded that a student’s speech, which was filled with sexual innuendos, could be limited. Justices explicitly stated their decision did not overturn Tinker, but they reasoned that administrators have a right to maintain the educational goals of the school environment. This is a reasonable concern, but administrators have taken the “educational environment” rationale to extreme levels, halting expression rather than using it to teach students about civil discourse and the long-standing American value of protest and free speech. Two years after Bethel, the court greatly narrowed student press rights in Hazelwood v. Kuhlmeier, providing school administrators the power to censor information students sought to publish in school media if it did not align with educational objectives. Many administrators have used the ruling as an excuse to censor student publications at whim. In 2018, the Student Press Law Center, marking Hazelwood’s 30th anniversary, hosted a day of action and started the hashtag #curehazelwood. Most recently, the court ruled against a student’s banner in Morse v. Frederick. Joseph Frederick, while not in attendance in school that day, joined his classmates on a public street along the Olympic torch run parade route. As the parade passed, he unfurled the large banner, which read “Bong Hits 4 Jesus.” The principal took the banner down and Frederick was suspended. In a 5-4 decision, justices determined the banner, though Frederick said it did not mean anything, was a pro-drug message, which administrators had a right to limit. Justices could have made this decision a turning point in the downward slide of student free expression rights. They could have chosen to emphasize that Frederick’s banner was displayed in a public forum, did not disrupt the educational environment, and that the principal, as a government actor, had halted his speech. Justices, however, took another chunk out of Tinker. The argument regarding student free expression rights is far from resolved. As more and more issues become political and divisive, student free expression will continue to be a challenging topic. Earlier this month, for example, a school district in Wisconsin banned the Confederate flag from its campuses, citing the need to protect the educational environment. New technologies are also complicating what constitutes the schoolhouse gate, as students use personal devices and social media accounts to threaten, harass and shame classmates in ways that have repercussions on campuses. Last spring, a high school senior in Alabama was given in-school suspension for criticizing administrators for not allowing students to take part in a walkout regarding gun-violence in schools. Does the school have the power to penalize student expression when its done on their own time on their personal devices? Tinker remains a valid Supreme Court precedent — something justices can draw from in future rulings — and its imagery of the schoolhouse gate remains a compelling and commonly cited argument for student expression rights. What Tinker lacks, and requires as it settles into middle age, is a renewed appreciation — from the courts, school administrators and parents — for what young people can contribute when they engage in matters of public concern and a recognition that safeguarding student speech is crucial to raising a generation that is not only aware of its rights, but knows how to exercise them. Jared Schroeder is an assistant professor of journalism at Southern Methodist University — Dallas, where he specializes in First Amendment law. He is the author of the 2018 book “The Press Clause and Digital Technology’s Fourth Wave: Media Law and the Symbiotic Web.” He wrote this for InsideSources.com. Dogs are more sensitive than humans to the psychotropic (mind-altering) effects of tetrahydrocannabinol (THC) in cannabis products. Disclosure statement: Colleen Dell receives funding from Canadian Institutes of Health Research & the University of Saskatchewan. Erin Wasson and Kevin Cosford do not work for, consult, own shares in or receive funding from any company or organization that would benefit from this article, and have disclosed no relevant affiliations beyond their academic appointment. Partners: University of Saskatchewan provides funding as a founding partner of The Conversation CA. University of Saskatchewan provides funding as a member of The Conversation CA-FR. Signs of poisoning can include uncoordinated movement, disorientation, hyperactivity, dilated pupils, drooling and dribbling urine. The idea is gaining steam. Legislative committees in Colorado and New Mexico approved NPV just last week. A House committee in New Hampshire is scheduled to consider the legislation this week. More efforts can soon be expected in places like Oregon, Minnesota and Virginia, where the legislation is pending. First, small to mid-size states can never receive equal treatment under a national popular vote system. How can they? Candidates have limited time and resources. They will not work to build support across state and regional lines without an Electoral College to force the subject. Consider that Hillary Clinton won fully 20 percent of her individual votes from only two states: New York and California. The mistake cost her the election. But without the Electoral College, she would be rewarded for such behavior, and candidates would be sure to double down on the strategy. New Hampshire, Wyoming and other small-population states would easily be lost in the shuffle. NPV guarantees unfair treatment of voters in one final way: It acts as if “consent of the governed” is unimportant, pretending that a simple interstate compact can be used in lieu of the constitutional amendment process. “We the People of the United States” consented to a Constitution that creates a state-by-state presidential election system. The Electoral College is just one of many checks and balances in our constitutional republic, preventing a bare, emotional or tyrannical majority from running roughshod over the rest of the country. “We the People” agreed that this process can be changed only if three-quarters of the states agree. Yet NPV attempts to skirt this process entirely. It is prepared to radically change the presidential election system, whether “We the People” consent or not. Tara Ross, a retired lawyer and a former editor-in-chief of the Texas Review of Law & Politics, is the author of “The Indispensable Electoral College: How the Founders’ Plan Saves Our Country from Mob Rule.” She wrote this for InsideSources.com.